The signing of the U.S. Civil Rights Act act banned employment discrimination and outlawed segregation in businesses and public places. The fight for civil rights by Dr. Martin Luther King Jr., and many others, was crucial to bringing about the act. 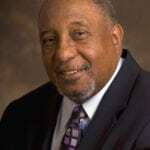 Dr. Bernard LaFayette worked closely with Dr. King and carries on his legacy today with Kingian Nonviolence training. He also chairs the board of another Dr. King legacy: the Southern Christian Leadership Conference. He spoke with KBCS’s Ruth Bly, in this two-part series. Part 1 – Dr. LaFayette speaks about what motivates him to continue this work. Part 2 – He describes how forgiveness can be used in action. Special thanks to Project Pilgrimage for arranging the interview.